This card is indeed perfectly perfect. Centered and 'perfect' are highly overrated. You can buy that. You cannot buy the time, care, and love put into a handmade card. Your card is PERFECT because you cared enough to make it. You are so funny! Paperella is right...fresh is the word for this lovely card. I adore that heart and its placement. You are a genius! Thanks everyone. I appreciate the comments! 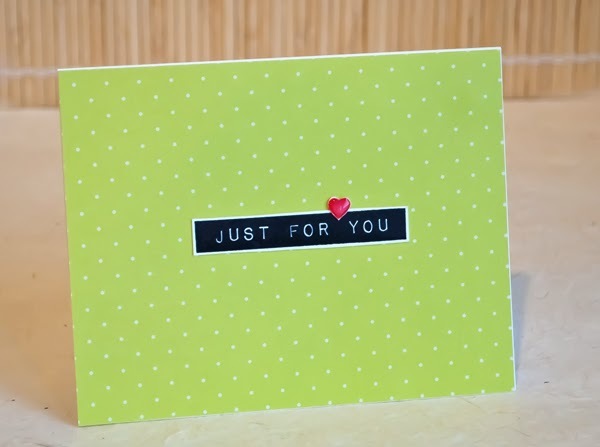 Love when people can laugh at their own perfectly imperfect cards! Thanks for a good laugh & delightful card. Thanks. I HAVE to laugh! I thought your card was "perfect". The first thing that popped into my head was the lyrics from a song that has been running through my head lately -- Love your curves and all your edges, All your perfect imperfections" (from John Legend's All of Me). Wish I could love my imperfect cards! Love love your commentary. And, the card looks pretty perfect to me. Any slight imperfections just prove that it is a hand made one-of-a-kind treasure. This would be hard for me, too. First, the simplicity is difficult for me, then tiny things give me fits. I didn't notice the imperfections till you pointed them out because I'm just so smitten with the finished look of it. You get tons of credit just for coming up with the design. Love the label look of the sentiment and how the black pops on the green. The itty bitty heart is perfectly placed. The "perfects" far outweight the "imperfects".